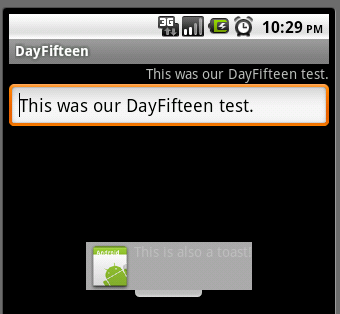 In today's entry in the 31 Days of Android series, we’re going to look at Toasts. 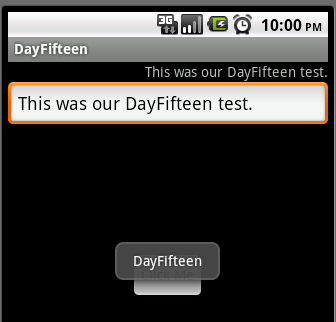 A toast is a simple pop-up notification that will inform users of something. 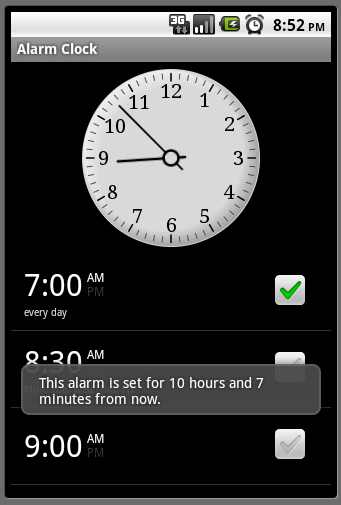 To see an example of a toast in action, open up the Alarm & Timer application and set an alarm. When you do so, a toast appears saying that an alarm has been set and for how long from now it’s set. These toasts appear for a limited time and don’t offer any sort of user interaction. You can download the code we’re going to start with today here. Let’s look at each call to makeText. You’re passing in the Application Context for both of these method calls. You could have passed in the Activity context if you had access to it. Since your calls to makeText were in the onClickListener you didn’t have access to it (though you could have created a member variable on DayFifteenActivity and set it to the current activity prior to the onClickListener if you wanted to). As mentioned before, one of the methods is taking in a String and the other takes in a Resource ID. The last parameter passed in is an integer for how long the Toast should show up. You might think you could pass in any amount of time in milliseconds here but that isn’t the case. You can only pass in Toast.LENGTH_LONG or Toast.LENGTH_SHORT. LENGTH_LONG corresponds to 3.5 seconds and LENGTH_SHORT is 2 seconds. It might be possible to override Toast to show it for shorter or longer periods of time, but I think the intention is to keep these sort of notification similar from app to app. Lastly, since makeText returns a Toast object you call show to make it appear on the screen. It’s worth noting out that once you’ve called show on your Toast, it does not show up immediately. The first call to show appears first and then any other calls will appear in sequential order after that. In this way, you’re prevented from showing multiple Toasts but only getting the last one on screen. If you wanted to make a slight adjustment to where the toast appears, the second and third parameters to setGravity will offset it for you. 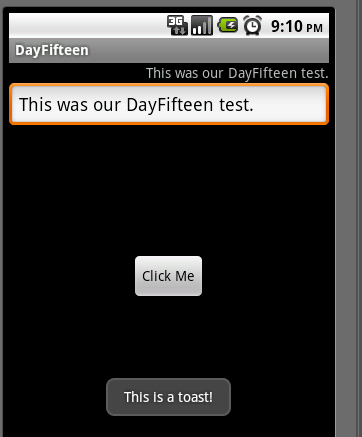 Toasts are a simple and great way to get information to users. Now you should have knowledge to show them when you want, for how long you want, and make them appear how you want them to. You can download the final code from today’s app here.